Here's a little pictorial of our Paint Rock, Alabama, excursion. Casper Cox (Chattanooga, TN) scouting our targets. Fundulus catenatus - I only managed to catch 2 of these. Greenside darter - At least, I think so. He wouldn't hold still! L - R: Bruce Stallsmith (Huntsville, AL), Vitaly (Birmingham, AL), Nick Sharp (Huntsville, AL), Dave Neely (Tuscaloosa, AL, or anywhere in North America where fish live), & Casper Cox (Chattanooga, TN). Not pictured, Steven A. Ellis (Kennesaw, GA, I'm on the backside of the camera). Our NANFA President, Bruce Stallsmith and our new Russian friend, Vitaly, discussing post-cold war collecting. I apologize again for the poor photographic quality of these pics, but I wanted to give you a little Southern sampler. The beauty of the South is positively intoxicating this time of year. Add to that the excellent mix of personalities in our group, and good times are bound to happen. Somehow, we compatably combine a great appreciation of life science and a love of God's creation, with respect for the differences...and the similarities. If your summer plans take you through the South, post your itinerary. Chances are very good that some of us can lead you to the fish! Now, get out there and collect. 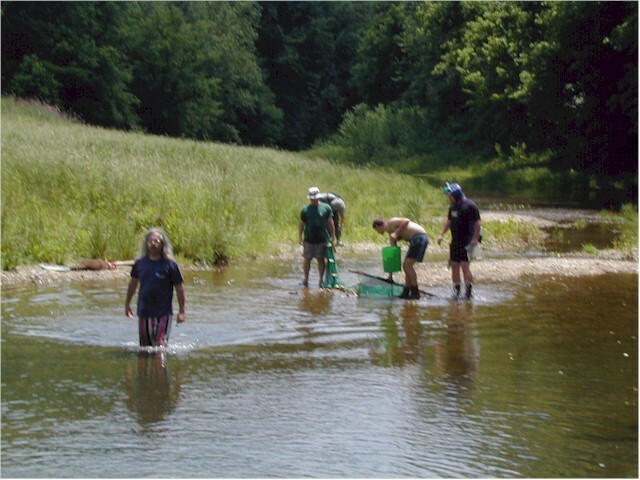 Further north in the mountains of Jackson County, the Paint Rock River watershed is part of the Tennessee-Cumberland freshwater region which is ranked number one in the U.S. for at-risk species of fish and mussels. The Paint Rock contains the only known populations for two globally critically imperiled mussel species, the Alabama lampmussel (Lampsilis virescens) and pale lilliput (Toxolasma cylindrellus), and one of only two known populations for the globally critically imperiled fish the palezone shiner (Notropis albizonatus). The Paint Rock watershed is still a healthy viable system, largely due to the fact that its headwaters are cloaked in large contiguous forested lands. Continued compatible land use will be key to the long-term health and preservation of this incredible watershed. Estill Fork at County Road 140, Jackson Co, AL. 26 May 2001 Dave Neely, Casper Cox, Bruce Stallsmith, Steven Ellis, Nick Sharp, Vitaly from Birmingham. Mostly snorkelling, some collecting with seine and dip net. Notes: Beautiful gravel, lush water willow beds, crystal clear water at 65 F, pH 7.6 and TDS 160 ppm. Species observed: longnose gar, largescale stoneroller, streamline chub, bigeye chub, striped shiner, scarletfin shiner, mountain shiner, palezone shiner (federally endangered, all released immediately! ), bigeye shiner, Tennessee shiner, telescope shiner, sawfin shiner, bluntnose minnow, northern hogsucker, shorthead redhorse, black or golden redhorse, mosquitofish, northern studfish, blackspotted topminnow, banded sculpin, rock bass, bluegill, longear sunfish, smallmouth bass, spotted bass, rainbow darter, fantail darter, stripetail darter, redline darter, Tennessee snubnose darter, greenside darter, blueside darter, blotchside logperch. Next we went to another striking spring, also at the base of an even higher limestone cliff face. Blue Spring is circular, about 50 feet across, probably 6+ feet deep in the middle and has a spring run. The water even made Casper complain about how cold it was! The Johnny darters were an interesting find; they have a disjunct distribution in the Paint Rock valley, and far to the southwest below the fall line they're common. They were the first I've seen. Blue Spring on County Road 20, Jackson Co., AL Dave Neely, Casper Cox, Bruce Stallsmith, Steven Ellis. Notes: bluish water, very cold. No vegetation. Collected with seine only. Species observed: striped shiner, blacknose dace, mottled sculpin, banded sculpin, bluegill, rainbow darter, stripetail darter, johnny darter, Tennessee snubnose darter, blueside darter, greenside darter. Selby Spring off of Co Rd 145, Jackson Co., AL. 27 May 2001. Dave Neely, Casper Cox. Notes: beautiful cliff faces and small cave. Collected with dip net only. Species observed: blacknose dace, banded sculpin. Isbell Spring, Jackson Co., AL. Dave Neely, Casper Cox. Notes: Nice cave system with knee-deep water at entrance. Collected with seine, dip net. Species observed: banded sculpin, bluegill. Flint River at Winchester Rd near Bell Factory, Madison Co., AL Dave Neely, Casper Cox. snorkeling only. Species observed: largescale stoneroller, striped shiner, northern hogsucker, rainbow darter, Tennessee snubnose darter, dusky darter. This site is one of my personal faves that I often visit with just a dipnet. 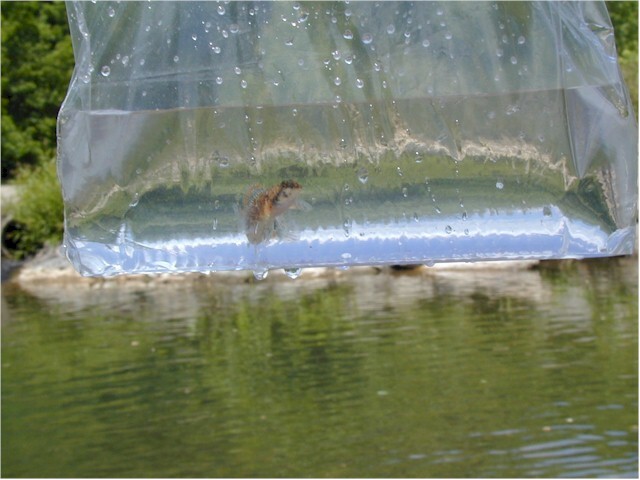 Using a seine increases the species count dramatically. I've also found greenside darters and stripetail darters at this site. Mountain Fork at Old Mountain Fork Rd, Madison Co., AL. Dave Neely, Casper Cox. Notes: Large spring ca. 2 mi. upstream. Abundant vegetation, including lots of parrotfeather, riverweed, pondweed, others. Water clear and cold. 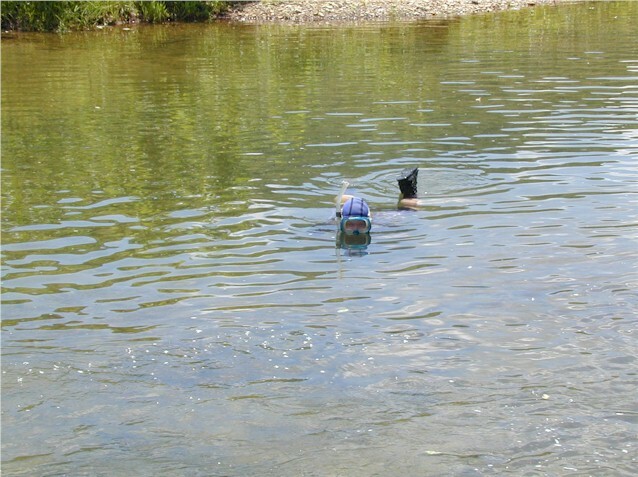 Snorkelling, seine. 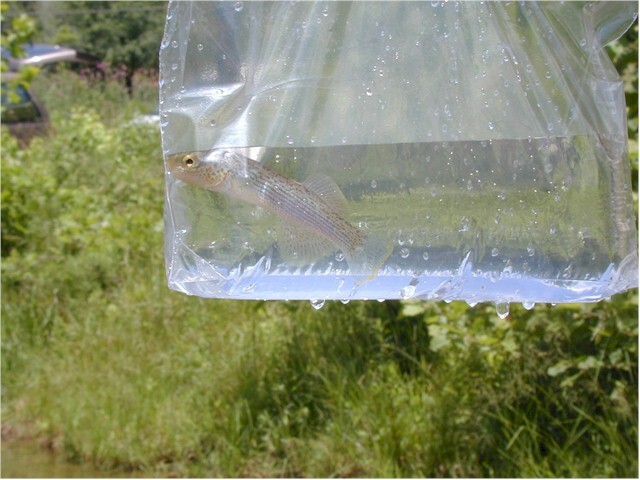 Species observed: largescale stoneroller, striped shiner, scarletfin shiner, flame chub, bluntnose minnow, white sucker, northern hogsucker, black or golden redhorse, mosquitofish, banded sculpin, rock bass, bluegill, green sunfish, longear sunfish, smallmouth bass, spotted bass, rainbow darter, blackfin darter, Tennessee snubnose darter. The following is a very public site that I've never collected, The cool find here was a large flame chub population. Mountain Fork at Winchester Rd in New Market, Madison Co., AL. Dave Neely, Casper Cox. Notes: immediately below small dam. Water clear, nice gravel riffles at site. Some silt, lots of very slippery bedrock. Species observed: largescale stoneroller, striped shiner, scarletfin shiner, flame chub (abundant! 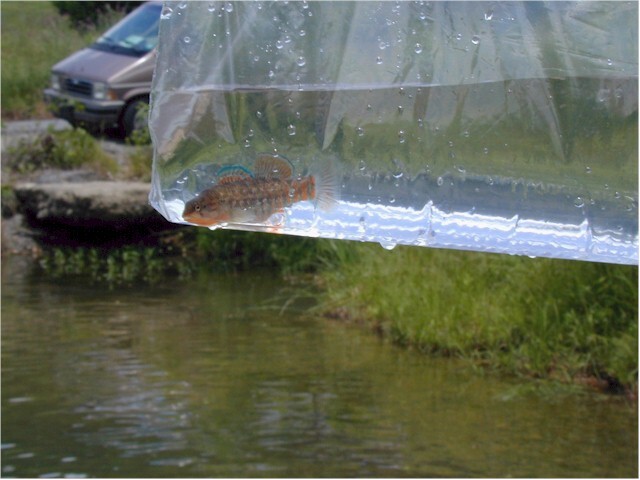 ), bluntnose minnow, white sucker, northern hogsucker, mosquitofish, banded sculpin, rock bass, bluegill, largemouth bass, rainbow darter, blackfin darter, Tennessee snubnose darter. The big news of all of this is the sheer fish diversity in the Tennessee valley. 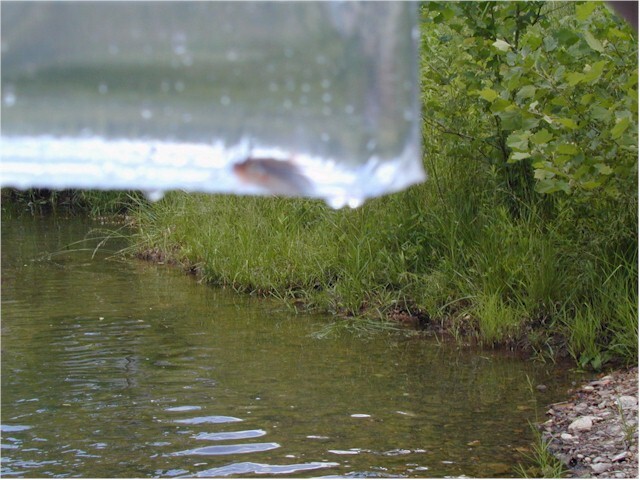 We found more species of freshwater fishes in the corners of two counties than can be found in many states. The Tennessee Valley super-region hopes to get out in the field again in about a month. Tentatively the next trip will be hosted by Dave Neely in the greater Tuscaloosa area, maybe along the forks of the Warrior River. hey guys! thanks to dr dave and prez bruce for writing up a great fish list and post on a wonderful trip. im really thankful dave took time to share his knowledge with us. i wish him luck on his grant quest and am always eager to help him anyway i can. Ive got to get some felt shoes to keep up with this young buck! its mighty slippery on some of those flat algaed rocks. we had a pretty good time setting traps in the darkand wandering streams with hi-intensity lights. pretty cool er cold... especially when you trip and fall in! :). we got to see a lot of interesting critters. cave salamanders, snappers, gar. hoped to see another hellbender. bruce mentioned a upcoming trip... we had discussed a 2 day trip to the sipsey west fork river in winston county. this is a beautiful sand bottomed wide river that has a wonderful diversity. My son and i visited it a month ago. it is located in central upper alabama near double springs and natural bridge ( also a neat area... big rock formations and patterns with a spring creek running thru its midst ). mid summer... july or early august would be good. anyone interested? we would like to get a camp on the stream side or sand bar if we could get a good location. perhaps we could all arrive the night before and get a motel... or better if someone could scout a camping site on the water. this would be a good central location for a lot of nanfa members too. After waiting for my betters to post the official report (nice job, Bruce), I'll add just a little. What a great day! The weather was perfect. After a moment of silence for Slim Aguilar, the six of us spread out in this beautiful stream, employing a number of collecting methods. With three cameras present, this may also turn out to be one of the TV region's best documented excursions. The Estill Fork location was easy to work, even for the middle-aged members of the crew. I can't remember when I've seen such a clean, plentiful stream. I can't stress enough, as a novice, the benefits of collecting with highly educated professionals. Each time out adds to the body of working knowledge, and increases the appreciation of aquatic life. One immediate benefit is having instant ID of the fish. When I collect alone, I often have to throw back some really beautiful fish if I'm uncertain whether they are endangered or not. In this respect, Dave Neely is a human field guide. When he ID's the endangered ones, I am able to watch out for them later. Also, Bruce is able to impart information about streams, plants, etc. in a way that is even palatable to a creationist. I haven't yet tried snorkeling, but the wonder that Casper describes below the surface of the water is getting me closer all the time. If any human ever grows gills, I'm betting on him! If you're in the region for the next meet, I encourage you to come out. I tend to forget how nice Alabama is until I visit. The fare ranges from moonpies to watermelon. Who knows, maybe next trip it'll be biscuits & gravy! Either way, my tanks have some wonderful new fish in them.